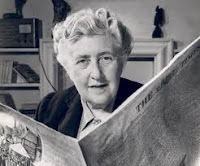 Agatha Mary Clarissa Miller Christie (Mallowan) wrote sixty-six mystery novels and fourteen short story collections and is known as the one of the Queens the Golden Age of Detective Fiction, although her career started much earlier. Her first book, The Mysterious Affair at Styles featuring Hercule Poirot was published in 1920. She was born into a wealthy upper class family. During WWI, she served in a Devon hospital that treated men coming back from the trenches. During WWII, she worked as a pharmacy assistant in London where she learned a lot about poisons (which subsequently showed up in many of her novels. 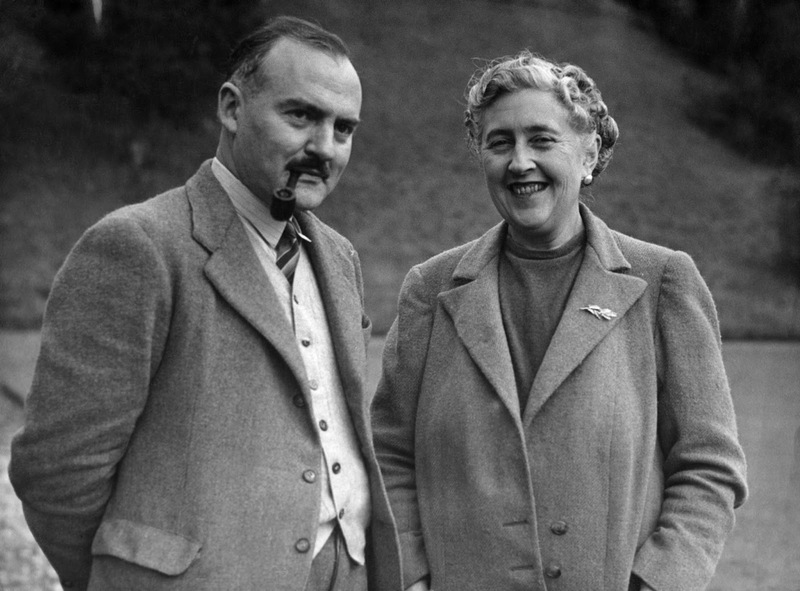 She met her second husband, Max Mallowan, on an archaeological dig in Baghdad and continued to follow him on expeditions throughout their married life. She was also officially a Lady because of her husband’s knighting in 1968 for his archeological work. 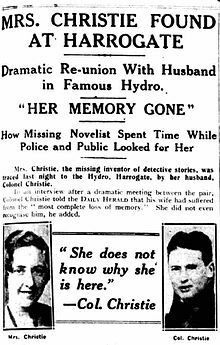 Perhaps the most intriguing tidbit about Agatha Christie is her disappearance in 1926. After an argument with her first husband Archibald Christie, she left the house after leaving a note for her secretary claiming that she was going to Yorkshire. Her car was later discovered at Newlands Corner with some clothes and her expired driver’s license. There was a public outcry, the news even made it to America where The New York Times posted an article on the front page. Home Secretary William Joynson-Hicks pressured police to do whatever it took to find her. A £100 reward was posted, and over one thousand police and fifteen thousand volunteers searched for her. Ten days after she left home, she was found at the Old Swan Hotel in Harrogate under an assumed name (interestingly she used Neely as her surname-the last name of her husband’s mistress). She was diagnosed with amnesia, but scholars and the media have long debated about the situation. Some felt it was a publicity stunt, while others think it was an attempt to embarrass her philandering husband. Still more agree that she may have suffered some sort of nervous breakdown because of her exhaustive writing schedule, death of her mother, and infidelity of Archie. She makes no reference to the incident in her autobiography, so obviously the truth will never be known. What do you think? And hope this posts, I've been having a lot of trouble posting on other people's blogs lately. I love the Brits, especially their detectives! I've only read a couple of Dorothy Sayers. Thanks for stopping by!